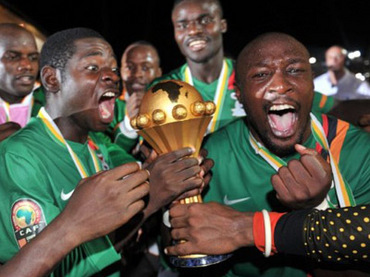 Didier Drogba’s ghosts returned to haunt him as Zambia won the African Nations Cup for the first time after beating Ivory Coast 8-7 in a drama-filled penalty shootout following a 0-0 draw on Sunday. Stoppila Sunzu converted the winning penalty after three successive efforts had been missed in a long and nervy shootout that totalled 18 kicks. The loss was another near miss for the Ivorian’s golden generation, who had been expected to win African football’s top prize at the last four editions but failed every time. Two of their English Premier League players – Kolo Toure and Gervinho – missed kicks in the shootout. Zambia, who had gone into the game as underdogs, won over the 40,000 crowd in the Friendship Stadium in the Gabon capital with their positive play against a surprisingly timid Ivorian side who failed to take the initiative in the game. After winning, the Zambian team held up banners remembering their side that died in a air crash not far from the stadium in 1993 and whose memory they had honoured on the eve of the game. But Drogba hit his shot well over and then seemed to sink into a sulk for the rest of the game. He was brave enough, however, to take the fifth penalty for the Ivorians in the shootout. The first 14 kicks were successfully converted before a reluctant Kolo Toure had his shot saved at 7-7 but Rainford Kalaba then missed for Zambia. Gervinho, who also did not want to take a kick, then missed before Sunzu won the cup for Zambia, who had suffered two previous defeats in the 1974 and 1994 finals. It was the seventh Nations Cup final to be decided on penalties. The most recent was when Egypt beat the Ivorians 5-3 in the 2006 final, which also ended goalless. Zambia’s goalkeeper Kennedy Mwenee said that his team had deserved to win against a team that did not concede a goal outside of the penalty shootout in the finals.